Radical Coloring Book now available! 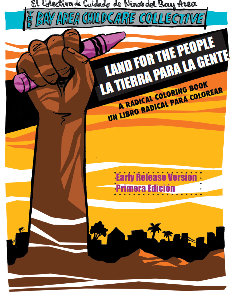 “Land for the People// La Tierra Para La Gente, A Radical Coloring Book” is now available to order online, by mail, or in person from core members! Get your coloring book now for a sliding scale donation of $2-$20+, which will go entirely to La Colectiva. La Colectiva’s parent organization La Raza Centro Legal has been threatened by massive budget cuts this year. bayareachildcarecollective@gmail.com with the amount of your donation and the intended method of your donation (online, check by mail, or in-person), as well as whether you prefer a printed or online copy. Please include your phone number if you would like to arrange an in person exchange and your address + an extra $5 for shipping if you are requesting a copy by mail. Use the donation button below if you would like to make your donation by credit card online.